It has only been a few days of Autumn here in Sydney and people are already run-down and suffering from colds, flus and freaking out about feeling run down and not wanting to catch anything! 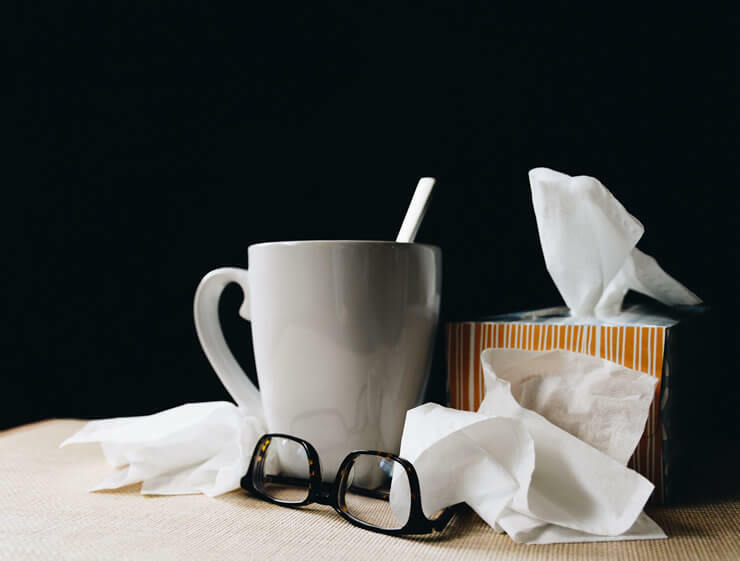 It’s common to hear people succumb to the notion that “it’s going around again,” but whether or not you get sick is dependent on the how well your immune system is functioning. Precisely who will get sick, who will not get sick and how well you will recover from illness is dependent on your ability to generate an effective immune response. The primary job of the immune system is to protect the body from infection by viruses, bacteria, fungi and parasites. It is constantly on guard, actively killing and removing pathogens to prevent you from becoming sick. Adequate functioning of this defensive system is in large part determined by nutrition. Let’s get back to some basics to keep your immune system fighting strong! Adequate protein intake is essential for building white blood cells, which are a key component of your immune response. White blood cells are responsible for properly responding to and destroying foreign invaders in the body. The turnover of immune cells is very rapid so you need to make sure you’re eating enough protein consistently to prevent immune mechanisms from becoming impaired. Fantastic sources of dietary protein include organic eggs, lean meats, seafood, good-quality dairy (full-fat, preferably organic), nuts, seeds, tempeh and legumes such as chickpeas, beans, peas, soybeans and lentils. Pumpkin seeds are a great plant-based source of the mineral zinc which keeps the immune system strong and assists wound healing. Organic butter or ghee, avocado oil, macadamia oil, small fatty fish and olive oil are all fantastic sources of dietary fat. Special mention goes to coconut oil for its high content of saturated fatty acids, which have strong antibiotic properties. Avoid fried foods, trans-fats (margarine) and heated vegetable oils. Cod liver contains anti-inflammatory omega-3 fats and is also a source of naturally occurring Vitamin A and Vitamin D. Vitamin A is essential for supporting the cells of the skin and promotes the formation of protective mucous in the gastrointestinal tract to prevent infection. Vitamin D is a powerful immune system booster and clinical studies have shown that a deficiency in Vitamin D can cause colds and flu by reducing the efficiency of the immune system. You can request a blood test to check your Vitamin D levels before supplementing. Eat high antioxidant fruits, vegetables and herbs daily to neutralize free radicals and quell disease-causing inflammation. Start thinking locally and seasonally to get the most nutrient density out of your food – apples, bananas, figs, limes, pomegranate, asian greens (bok choy), broccoli, beans, capsicum, eggplants, kale, mushrooms, onion, potato, pumpkin and zucchini are just some of the beautiful fruit and vegetables in season at the moment. Eat mostly plants!! Garlic and ginger are two winning superfoods for optimal immune function. Garlic is well known for its powerful antioxidant, anti-inflammatory, antibacterial and cardio-protective properties. Alliin is one of the main compounds found in raw garlic, which must be converted to allicin in to exert its antibacterial properties. This occurs after crushing the garlic and letting it sit for at least a few minutes. If you can’t stomach raw garlic and would prefer to supplement make sure that it has been standardised to contain alliin and alliinase, and that it is enteric-coated. Sleep and circadian rhythm exert a strong regulatory influence on the immune system. Be honest with yourself and reflect on the quality of your sleep – most people find that many of their health issues resolve when they start sleeping well. If you are struggling with sleep difficulties or insomnia speak to a qualified naturopath about herbal and nutritional medicine that can be formulated into a specific treatment plan. Increased levels of stress are notoriously associated with depleting immune function. The stress response triggers the adrenal glands to release the hormone cortisol, which interferes with normal sleep and weakens the immune response. Stress is an inevitable part of life and some stress can be beneficial, however when stress reaches chronic and harmful you could become much more susceptible to falling sick. Incorporating regular breathing techniques, meditation and yoga into your lifestyle are superb at reducing the negative effects of stress. The stress response consumes much of the body’s stores of vitamin C – the adrenal glands contain more vitamin C than any other tissue in the body. Focus on eating plenty of fresh fruit and vegetables or consider supplementation. The adaptogenic class of herbal medicines is fabulous at mediating the effects of stress as well as strengthening the immune system – talk to a qualified naturopath about which herbs would be most suitable for you. HERBAL MEDICINE: There is an arsenal of herbal medicine with proven benefits on strengthening immune function and reducing the severity of infection. Some are very useful during the acute stage of infection, while others should be avoided at this time and used at a later stage to aid in recovery. It’s important to take into consideration the stage of infection, the type of infection and different symptoms when using herbal medicine. Echinacea is a very popular choice amongst naturopaths for its immune-modulating, antiviral, antibacterial and adaptogenic properties. Eastern traditions have been saying it for thousands of years – disease begins in the gut. We now know that gut microbes play an essential role in immune function, with 70% of the cells of our immune system being in the gut wall! Having a flourishing ecosystem of “good” bacteria in the gut is essential for adequate immune function, whereas having less diverse gut bacteria is linked to inflammatory bowel disease and the increase in autoimmune diseases. Convalescence… if you don’t know what this word means it is a huge sign of the times in which we live today. When we get sick it our bodies are sending us a signal to slow down and rest so that we can allow our bodies to heal properly. In this day and age where society tends to value productivity over our own well-being, it can sometimes seem difficult to force ourselves to stop and rest. Convalescence enables the body to totally recover and restore vitality. In circumstances where we can not yet change our environment or allow ourselves to completely rest, we can harness the power of natural medicines to help the process along.